A vacation at sea can be a lovely way to unwind… and earn miles. Most of the major North American airlines offer their frequent flyers a way to earn thousands of miles by booking a cruise. Whether you wish to sail to the Caribbean, Alaska, or Europe, you can find a mileage windfall when you earn miles on your cruise fare as well as your flight. Many airlines sell cruises directly through their websites. You can earn 1,500 to 10,000 miles when you buy cruises through American AAdvantage Cruise, Alaska Air Cruises, America West Cruises, Continental.com Cruises, Frontier Airlines Cruises, Delta SkyMiles Cruises, and Northwest Cruises (only through March 31). United Cruises offers one mile per dollar spent. 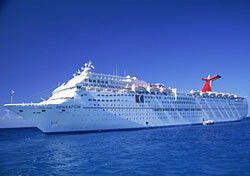 You can also purchase cruise packages through Midwest Airlines Vacations and earn 500 miles. Southwest sells cruises but does not award extra Rapid Rewards credits for purchases. The amount of miles you earn is dependent on the length of the cruise and the total cost of the booking. Most airlines only assign bonus miles once per stateroom and to one person per cruise booking. You’ll receive the miles six to eight weeks after you complete your sailing. A few airlines also partner with companies that sell cruises, and you can earn miles for your purchase in that way. You just need to provide your frequent flyer number when you make your cruise booking in order to earn miles with these partner companies. What are your options? Northwest partners with Cruise Locators, and you can earn two to three WorldPerks miles per dollar of the base cruise price when you book with them. Air Canada offers 200 miles per person per night for Celebrity and Royal Caribbean cruises, but you must have a minimum three-night stay. Alaska Airlines also partners with Royal Caribbean, and you can earn up to 5,000 miles based on the length of your cruise. US Airways offers up to 10,000 miles for Regent Seven Seas Cruises (formerly Radisson). You don’t have nearly as many options for redeeming miles for cruises. The only site that lets you pay for your vacation with miles is United Cruises. The number of miles you will pay varies based on which cruise line you choose, when your cruise departs, and where it’s going. You can use miles to pay for all or part of your cruise fare, but you must pay a minimum of 10,000 miles. You can also combine miles from different accounts, as long as you pay at least 10,000 miles from each account. Once you’ve chosen your specific sailing and receive the final price, you can enter the number of miles you wish to pay and the website will calculate how much money you will owe after the miles, if any. I tested a four-night Royal Caribbean cruise sailing to the Caribbean on June 15, booked in the lowest-category inside stateroom. The total price came to $1,222.50 for two adults, and you would need 200,000 miles to completely cover the cost of the cruise. While you may need to be a miles millionaire to get a free cruise, frequent flyers with over 10,000 miles can defray some of the cruise costs by redeeming miles. Miles junkies may prefer to book a cruise that also earns miles to one that doesn’t, but it’s always best to figure out the total value of your purchase before you pay. You should always compare cruise fares across a variety of vendors with a tool such as SmarterTravel’s price-comparison feature. You can calculate the value of your miles by multiplying the number of miles earned from the cruise purchase by one cent per mile; then subtract that price from the total price of your cruise. If you find the same cruise for cheaper somewhere else, it might be in your best interest to forego the miles and pay the lower rate. However, if the price of your cruise (adjusted for the value of the miles) is the best deal around, you may have found yourself a great vacation bargain.